Planning and executing travel plans can be a stressful process, in part because there are dozens of choices to be made – and one of the most crucial involves the amount of expendable cash you carry during your journey. Fifty years ago, cash was an integral part of the travel process. Nowadays, credit cards and online banking have made our finances more available than ever – but certain situations and circumstances can still require cash. There are a variety of unpredictable factors that can cause you to fall back on a cash reserve, but a basic understanding of your travel plan can help to set an emergency budget. For travelers from the Americas and parts of Europe, it can seem like cash is a relic of a bygone era – but not everywhere has developed at the same speed, and many countries around the world have only spotty ATM and card-reading services. The critical aspect here is research – researching the towns or cities you’re planning on visiting can clarify your expectations and help set a standard for how much cash you’ll need during your stay. Remember that some parts of the world can be risky for travelers and consider investing in a money belt or other cash-storage accessory. Exchange rates are also worth considering – if you’re working on a budget, consider trading cash for the native currency with those exchange rates in mind. If you’re planning on using rideshare services during most of your trip, you might have the opportunity to avoid driving – but if you’re planning on making a long trip by car, you should make sure to carry a little extra gas money as well as a standard toolkit. While urbanized areas rarely lack card readers, rural regions sometimes require cash – and running out of gas in the wrong place can mean the difference between a fun trip and a lost weekend. 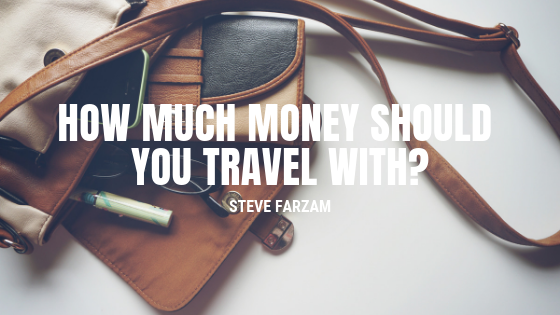 You should also remember that traveling is, for the most part, a lot of fun – you should expect to splurge and make decisions driven by the heat of the moment, so leave yourself some wiggle room to have a good time. The era of cash may be fading, but memories last forever.